In wishing all our clients a happy New Year, it is worth noting that 2018 is already shaping up to be another year of change. We are seeing distinct shifts in the international arena, while at the same time, our local political sphere has also witnessed significant changes, including a strengthening of the rand that bodes well for the near future. Although the general economic situation remains challenging, there seems to be greater optimism and business confidence in comparison to last year. As this sense of dynamism pervades further, Ascent Technology expects to witness an increased uptake of its various offerings by the market, and we are looking forward to using this as a platform to once again further increase our capacity, skills levels and our ability to service our clients. Having begun our international expansion late last year, with the launch of Ascent Technology’s Middle East office, we are pleased to note that the new office – based in Dubai’s Internet City – has got off to a positive start. We successfully introduced ourselves to this dynamic region through our presence at Gitex Technology Week, and we have since begun doing business and delivering to clients. In addition, Ascent recently hosted a series of successful workshops which allowed us to demonstrate our high level skills and expertise in the Enterprise Data Platform arena, and we expect to build on this and accelerate our growth in this region in 2018. Cloud computing is a big part of what Ascent does and is something that is an integral part of our operations and services. This is because cloud computing today can be described as having moved beyond ‘hype’ and into the area of ‘business as usual’. This acceptance of cloud computing as a mature technology and business model is only reinforced by the news that South Africa will receive its own Dual Region Azure Cloud Instance from Microsoft in 2018. While there is no doubt that this will further accelerate the cloud adoption of organisations, we remain aware that different clients are at different stages in their own cloud adoption journeys. With Ascent Technology having made the investment in becoming a Microsoft Tier One Cloud Solutions Provider (CSP1), we are ideally positioned to walk this journey with our clients. Not only are we well placed to assist clients in unlocking the additional value this journey will bring to their organisations, by helping them to build their required cloud solutions, but we are also able to add further value by offering them the opportunity to consume their Microsoft Azure Cloud Services via Ascent. While Ascent Technology’s core business remains focused on solving our clients’ Data Platform challenges, we are aware that there is a growing acknowledgment around the threats presented by security breaches, as well as a recognition of the importance of business intelligence to corporate success. For this reason, we have begun evolving our services to meet the increasing demands being voiced by our clients in these particular areas. Security breaches and threats continue to raise concerns among the business community, with many practical examples to be found in the local market in the past year. These include the notorious ‘Gupta Leaks’, the news that millions of South African ID numbers were leaked from a database, and the current challenges created by the Spectre and Meltdown hardware vulnerabilities. Such challenges have always been high on most enterprises agendas, but historically, the focus has been placed on the data centre and perimeter security. Increasingly, however, there is recognition of the growing number of threats to databases, including that of unauthorised and even malicious internal access to the data within. It is with this in mind that Ascent has developed a solution designed to ease the fears of CIOs. Known as DB Shield, this service protects databases on a network via a set of preconfigured defences, enabling clients to build custom security policies to suit their individual environments. This, in turn, makes it easier to demonstrate compliance and improve critical asset data protection. 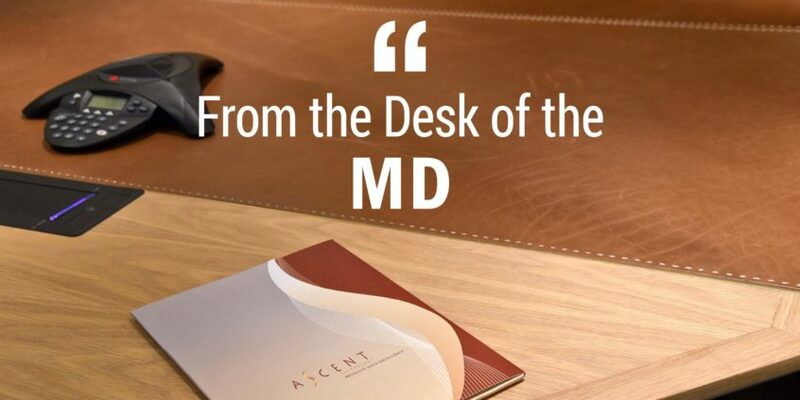 Ascent began expanding its services into the BI arena several years ago, and has made some significant investments in that period. During this time, the traction and growth we have achieved has been substantial, and we have assisted many of our clients to transform their complex data into effective business insights. Our continuing success here has led to a concentrated effort to evolve our BI capability through a number of channels. Watch this space for further announcements in this regard during the course of 2018. Having said all that, although we may be evolving, Ascent remains true to its core business of Managed Database and BI, Consulting and Support Services. We continue to be an industry leader in this space, as noted by our growth, irrespective of challanging times. Thus, even as we add new services to our overall offering, we will continue to service our clients in the manner they have become accustomed to, providing them with a technology independent, multi-platform trusted partner, that is able to assist them with all their Enterprise Data Platform needs. Finally, we would like to take this opportunity to thank all our clients for their trust and for the long term relationships this trust has enabled us to build with them. This year is one that suggests significant change and we are certainly looking forward to a successful year, and wish all our clients the greatest success during 2018.